I love chicken and I love prosciutto, so Chicken Saltimbocca is right up my alley. Earthy sage and salty prosciutto take this chicken to the next level. For these Chicken Saltimbocca Sandwiches, I thought it would be fun to incorporate the sage into an herby, lemony mayonnaise topping and I think it worked out perfectly. I also breaded the chicken because that’s my favorite. 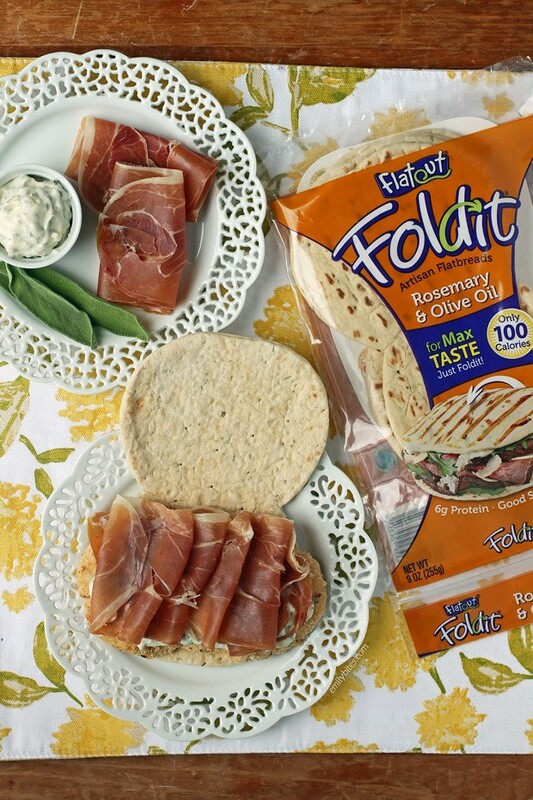 I chose to put the sandwich on Flatout’s Rosemary and Olive Oil Foldits because the flavors complement each other perfectly. Good decision! 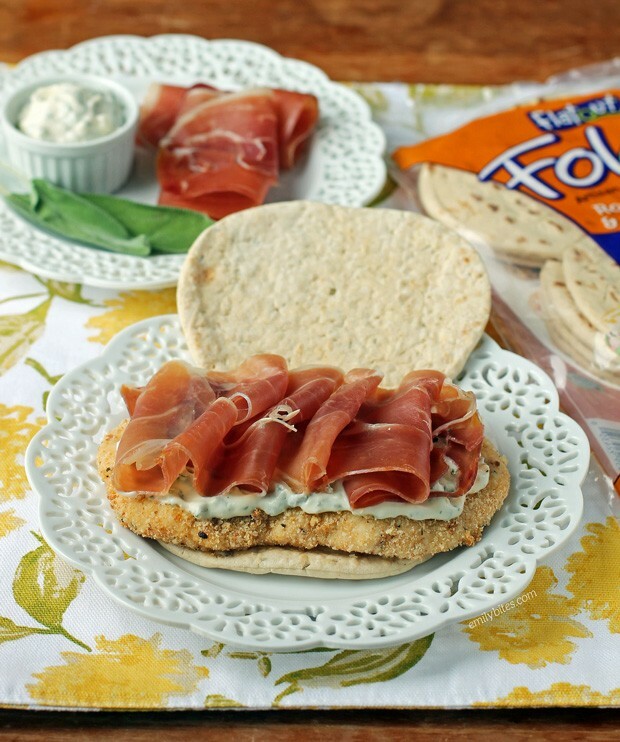 These Chicken Saltimbocca Sandwiches make a great lunch or dinner option and it’s super easy to double the recipe for the whole family. 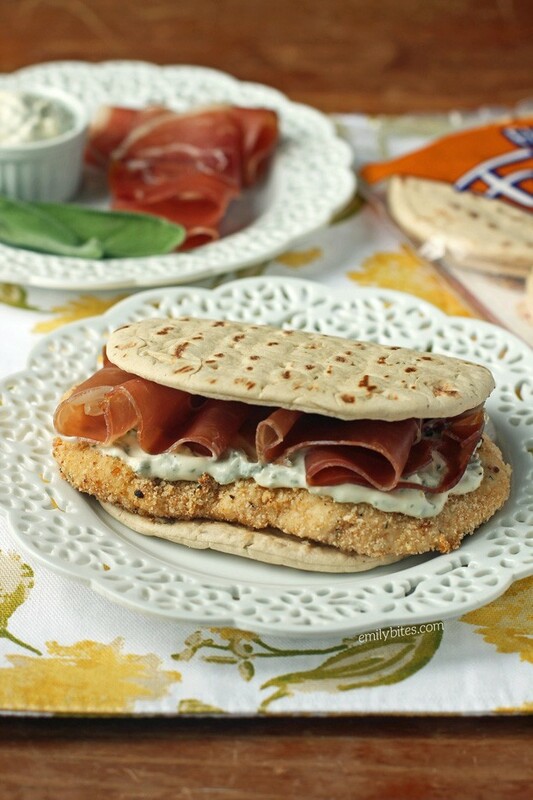 Plus, each sandwich is only 330 calories or 7 Weight Watchers SmartPoints! Most of you probably know that I absolutely adore Flatout flatbreads and have been using them for many years. They’re one of the most versatile products in my pantry! You can make wraps, pizzas, sandwiches, pinwheels, quesadillas…the possibilities are endless! The foldits in particular are perfect for sandwiches (they are perfect for achieving my ideal bread-to-filling ratio) and even make delicious hot sandwiches (melts, grilled cheese, etc). I love cooking foldit sandwiches in a skillet and letting the outside get a little crispy. Flatouts are also great if you’re tracking calories, Weight Watchers SmartPoints, protein, carbs – they’re got something for everyone! Looking for more Flatout recipes? Check out my Black and Blue Steak Wraps, Spicy Southwest Chicken Wraps, Three Cheese Mushroom Flatbreads, Buffalo Chicken Pinwheel Wraps, Spinach Artichoke Flatbreads, Greek Snack Flats, Mexi Burgers with Guacamole, Chinese Chicken Wrap, Chicken Pesto Flatbreads and Bacon Cheeseburger Wraps. Pre-heat the oven to 375. Line a baking sheet with aluminum foil or parchment paper and lightly mist with cooking spray. Place the chicken pieces in a Ziploc bag and sprinkle with the flour. Seal the bag and shake and massage the chicken until the chicken is completely coated with flour. Beat the egg white in a bowl with a whisk until frothy. In a shallow bowl or dish, combine the bread crumbs and grated Parmesan and mix together. Dip each flour-coated chicken cutlet into the egg whites, coating all sides and then allow excess to drip off. Then dip the coated chicken into the bread crumb mixture, coating all sides and transfer the breaded chicken to the prepared baking sheet. Sprinkle with a bit of salt and pepper to taste. Spray both sides of the breaded chicken with cooking spray and bake for 15 minutes or until chicken is cooked through. While the chicken is baking, mixed the diced sage into the mayonnaise in a small dish. Squeeze the lemon wedge over the mayo and then sprinkle in a pinch of black pepper. Stir until well combined. When the chicken is finished, lay out the foldits and place a cooked chicken breast onto one side of each foldit. Spread half of the sage mayonnaise across the top of each chicken breast and layer the sliced prosciutto over top of the mayo. Close the sandwich and serve. Where did you get those super cute plates?